Moving is the worst. It’s stressful, expensive and downright exhausting! My husband and I just moved into a new house. We have spent months planning, looking for the perfect home, packing and finally moving. Now that we are in our new home, I have a chance to catch my breath and reflect on the moving process. As much as I dislike moving, there are some great benefits to going through a big move. Benefits that can even be applied to real life! While I hope to stay in this house for quite a while to avoid another move, I plan on using this experience to purge and clean up my own life. A move would not be successful if you decided to throw everything together last minute. The same goes for life! Plan ahead, set goals, think before acting. Obviously, not every part of life can be planned or controlled. In fact, most of life is made up of unexpected moments and incontrollable circumstances. But it is important to set goals for where you want your life to go. 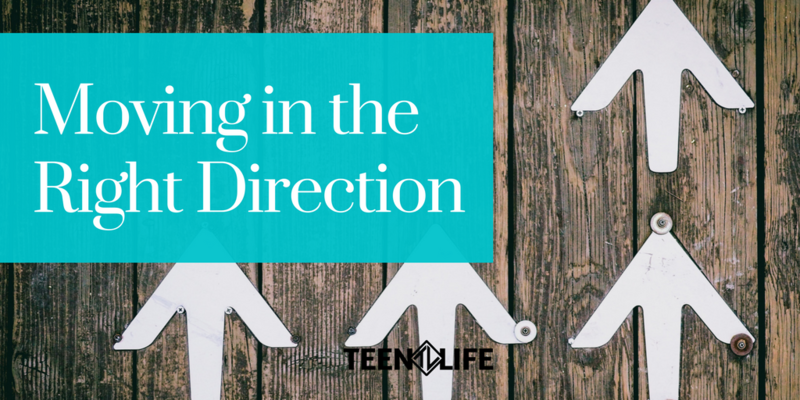 It is hard to make a move in the right direction if you don’t know where you’re headed! In all of our support groups, we ask students to share where there lives are now and make a goal for where they would like to be in the future. These don’t have to be big goals; in fact, we encourage small, simple things at first. Maybe it is getting a few extra hours of sleep, having a more respectful attitude towards adults, or replacing a bad habit with a better coping skill. Write down a plan. Be willing to be flexible, but don’t compromise on your goals! We had so much to move…lots of boxes, décor, clothes and more! But before we started packing, I took the extra time to purge clutter and items that I knew we wouldn’t use in the new house. This was time consuming and frustrating in the moment, but now that we are in the new house, I am so glad that I got rid of the clutter! I was not interested in moving broken, old or useless things in this new home, which gave me a better chance to start fresh. We have clutter in our lives that we need to get rid of before we start moving to the place we want to be. Clutter could include something like a bad habit, or clutter could also be something good that is taking up too much time or space. The best way to get rid of clutter is to list the things that take up our time and energy. Once this list is complete, ask yourself, “What are the things that I dislike doing? What are the things that I could get rid of?” Not all clutter is bad. But it is important to free up space in your life for the things that help you reach your goals! Before you make a big move, start cleaning. When we moved, our furniture was dusty and the rugs were gross. Instead of being smart and saving energy on the front end, I created more work for myself and brought dirt from our old house into this new home. It is hard to have a clean start when you are bringing dirt and mess from your past. Similar to removing clutter, it is so much better to clean up your life before trying to make a big life move. Clean up your language, your time management skills, any grudges you are holding on to, or the way you handle stress. It is so much better to make a move knowing that you aren’t bringing dust from past experiences. There is no way we could have made this move without friends and family. They helped us pack, gave us advice, and even gave up a Saturday afternoon to make sure we were moved in to our new house. I can’t imagine how much more stressful this situation could have been if we did not have the right people around us encouraging us the whole time. The same is true in life. Connection and relationship are vital to success, especially when you are trying to tackle something new and big. When trying to reach a goal or make a life change, don’t do it alone! Reach out to those around you for support and encouragement. According to the CDC, teenagers who feel connected are less likely to engage in risky behaviors and more likely to have higher grades and better attendance at school. That is no coincidence! Positive, life-giving people make all the difference. Relax and celebrate the small accomplishments. I am still telling myself this as I stare at the mountain of boxes and stacks of things to be put away around my house. It is so easy to get overwhelmed when going through a big move. You see a To-Do list a mile long and often don’t take the time to properly celebrate how far you have already come. Last night, we unpacked the study. It is one small room, but it is an accomplishment that doesn’t need to be overlooked! Especially with students and teenagers, we need to celebrate the small accomplishments when they happen – this encourages continued growth and forward motion. So maybe they haven’t made straight A’s yet, but celebrate that they passed their last test! Do they still have an anger problem? Celebrate when they handle one situation in a healthy way. Give them credit for helping out around the house even if their room isn’t completely spotless. Celebrate the little moments. This doesn’t mean that you have to throw a party or lower your expectations, but stop for a reward when you make steps toward your goal. Go out to your favorite restaurant. Give yourself permission to spend a fun weekend with friends or relaxing in the bathtub. Take the time to be proud of the progress you are making. Moving houses or moving directions in life can be frustrating, overwhelming and simply not fun. But let’s encourage each other to continue to move to a healthier place!